Trilobites existed on Earth for about 300 million years – they were excellent at adapting to the changing Earth. 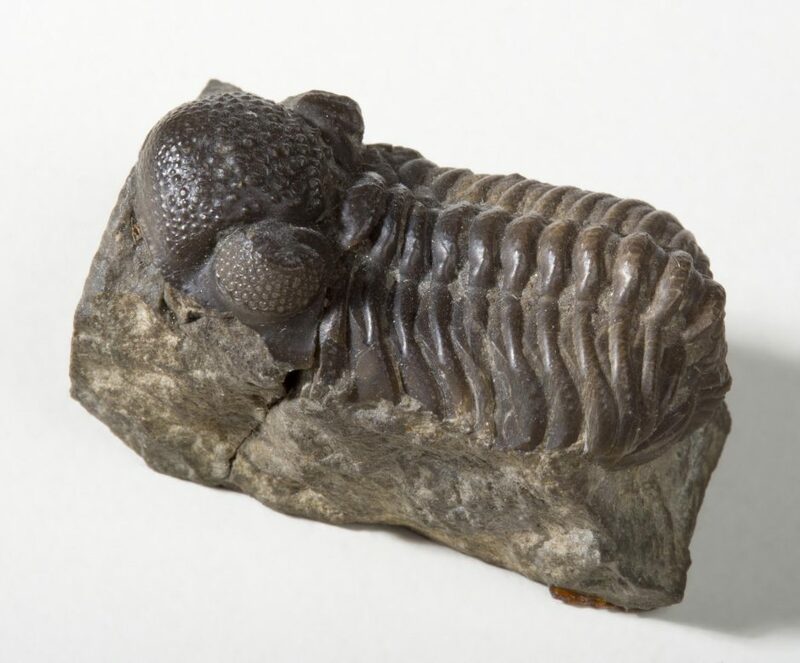 Today, I’m focusing in on one of the most fascinating things that evolved in trilobites and helped them survive over the course of all those millennia: their eyes. Let’s take a look! Trilobites had the first real complex eyes (that we know of). 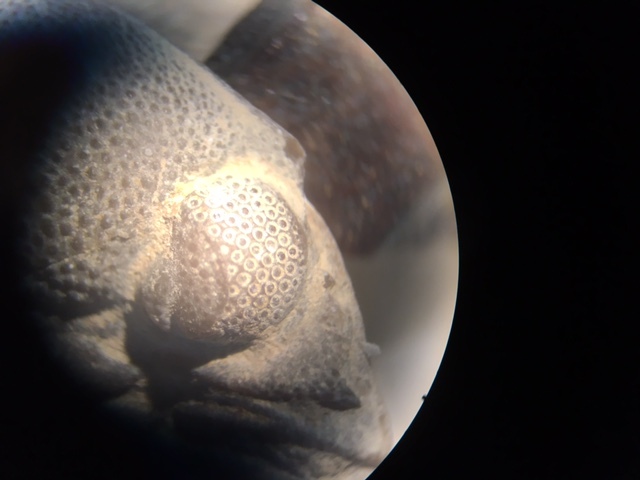 They were compound eyes, which are eyes that have many separate clusters of photo receptors, called ommatidia, each with it’s own lens that then turn all those bits of information into a mosaic-like picture in the animal’s brain. Today, animals like insects and crustaceans have compound eyes. By comparison, humans and most other vertebrates have simple eyes. 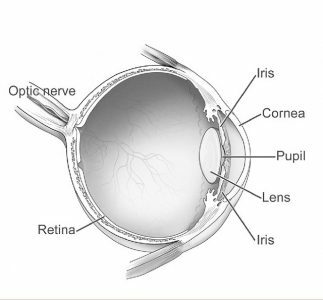 Though there are many different types of simple eyes, human simple eyes have one lens and one large grouping of photo receptors called the retina that take in the whole image at once. Of course, this is a simplified explanation; there are lots of really interesting details to discover about both of these types of eyes and how they work. 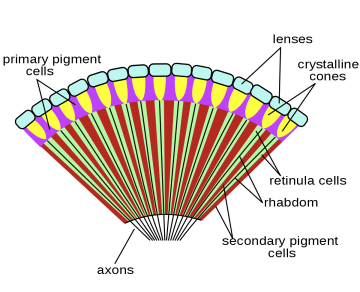 The two main types of compound eyes trilobites had were holochroal and schizochroal eyes. The main difference is that holochroal eyes have many lenses covered by one cornea, whereas schizochroal have many lenses, each one covered by a separate cornea. Likely, their eyes would have appeared a dark brown if we could see one alive today. Trilobite lenses were made of calcite, which is a mineral. Unlike the lenses on human eyes that are soft and able to stretch or contract to focus on things, the trilobite’s hard lenses could not change shape. So, how could they focus on things far away or very close without the image being blurry or having some sort of weird distortion? The answer is in the shape. The shape of both the holochroal and the schizochroal eye lenses, while different, achieve the same goal: the ability to see clearly without seeing ‘ghost images’ at any distance. This was achieved through the shape of the lens that were, coincidentally, created millions of years later by Huygens and Decartes when trying to view the stars without any sort of spherical aberration. 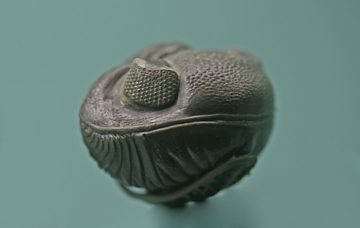 Many different kinds of eyes have evolved since the beginning of life on Earth, but the trilobite’s eyes were the first ones that could truly ‘see’; they tell us a lot about how vision in other animals might have evolved. Interested in learning more about fossils? Check out our fossil collection that comes from the Pacific Museum Of The Earth’s fossil collection.